Now it’s my turn to throw my hypothetical check at a car. I’m partial to small cars with big motors, and a 5.4L V8 with 355HP in the smallest Mercedes-Benz available in the U.S. qualifies. 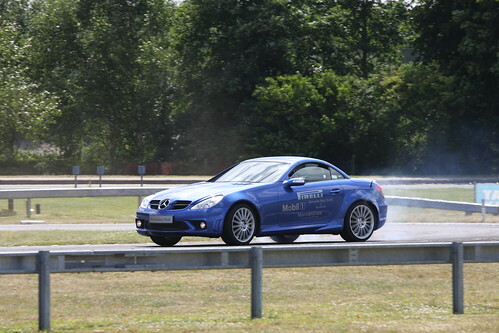 I thought the SLK32 AMG was cool when it came out with it’s 3.2L Supercharged V6, but when you shoe horn a V8 into a car such as the SLK, it makes my heart flutter. These cars have always been out of reach, but with $30K burning a hole in my pocket, this is one I would seriously consider. You can now find one for $20K with a lot of miles, so add some more money to that to get a lower mileage example would be my choice. The thing the worries me most with Mercedes-Benz is the maintenance costs, but that leaves your mind the second you mash the gas pedal through the floor and the rear tires light up. It would do 0-60 in less than 5 seconds, and I’ve owned only a few cars that were capable of that. You often hear about new supercars that are pulling 0-60 in 3 seconds and less, but in the real world, this car is more than capable of getting you to work, jetting off to Vegas for the weekend, and carving the canyon. Maybe I’m swayed by sunny California, where I’m writing this from, but being able to drop the top makes this car all that much more appealing. With my $30K check, this would be one of the cars I’d put on my list.